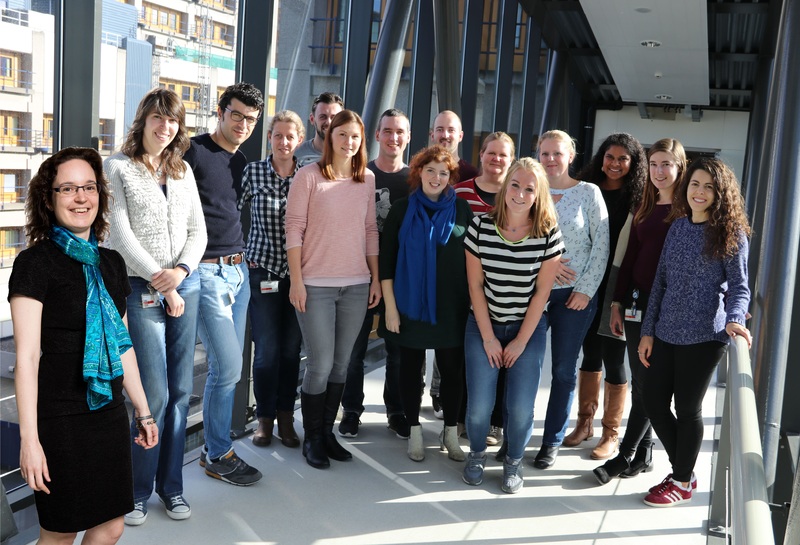 The primary mission of the DMD Genetic Therapy Group at the Department of Human Genetics of the Leiden University Medical Center is the development of a genetic therapy for Duchenne muscular dystrophy (DMD). The project started in 1998 and is currently supervised by Prof. Dr. Annemieke Aartsma-Rus, after Dr. Judith C.T. van Deutekom left in February 2007 to work as Head of research for the biotech company Prosensa B.V. (Leiden, the Netherlands). In a joint effort the DMD Genetic Therapy Group and BioMarin (previously Prosensa) are developing antisense oligonucleotides (AONs) as small synthetic molecule drugs for DMD. The DMD Genetic Therapy group also studies muscle pathology in dystrophic cell and animal model systems, ways to improve muscle quality, the identification and validation of biomarkers and the processing of the dystrophin transcripts. The DMD Genetic Therapy Group was awarded for its research by the Princess Beatrix Fund in 2001 and by the LUMC (C.J. Kok Award) in 2003. We hope you find all the information you are looking for on this webpage. If not please do not hesitate to contact us by using the contact form. For Parents of Duchenne Muscular Dystrophy patients we have created a special website (in Dutch and English), written in a non-scientific language. Please have a look and let us know if you miss information. Recently a new video has been created to show a “bit more behind the scene footage” of our work here in Leiden and tells a bit more about exon skipping and the DMD disease. Duplications are challenging for the mutation specific type of approaches (exon skipping). However, there are other appraoches in development. what can i do if i want exon skipping…. i am suffering from dmd…. Exon skipping is an approach that aims to slow down disease progression. Muscle function that is lost will not return. It is also a mutation specific appraoch. Not all mutations are suitable unfortunately. Dear Annemieke , today i heard the last part of an interview with you on Radio1 about the influence of mobile phones on the well-being of youngsters. What survey or news item did this refer to? Would you also think that such devices have an impact on persons at their workplace? As i am interested in how advanced automation and robotisation will impact the life of people on the workplace. My interest is therefore both professional and private. Thank you in advance for your response. The problem with mobile phones and tablets is that they produce a lot of light – especially in the blue spectrum. This is not harmful in itself. The problem is that blue light interferes with the production of melatonin. Melatonin is a substance your body makes that helps you sleep. It needs to accumulate for about 3 hours before there is enough to get you to sleep easily. So if you use tablets or mobiles in the evening, melatonin can not accumulate due to the blue light exposure. This can lead to difficulties falling asleep. So it is not the mobile phones that are harmful, but the lack of sleep if you use them until very late. Hi, we’re desperately trying to find out how to get exon skipping for TJ. He’s a three year old boy who has just been diagnosed. We’ve just started raising funds to help us in our endeavour. However we have no idea where to start in terms of having access to the treatment or how much money we need or even when he might be eligible for the treatment. Please, please help us? Any information on who to contact or how to start on this journey would mean the world to us! Thank you so much for taking the time to read this. I hope to hear from you soon. Warm regards Mrs Jennifer Batterbee. What is TJ’s mutation? Not all mutations are suitable for exon skipping. Het is niet mogelijk om dit middel te gebruiken – het is namelijk niet een medicijn want nog niet goedgekeurd. De ontwikkeling van de “Biomarin/Prosensa” exon skip middelen is gestopt omdat de bijwerkingen niet opwogen tegen de zeer beperkte effecten in een klein groepje patienten. In Amerika is afgelopen week een ander exon skip middel goedgekeurd (Eteplirsen, van het bedrijf Sarepta). In Europa wil Sarepta ook exon 53 middelen testen. Good care is very important to keep Duchenne patients as functional as possible for as long as possible. The exon skipping approach probably will not apply to your son. The approach aims to restore the genetic code. However, a deletion of exon 45-53 does not disrupt the genetic code (so therefore it cannot be restored). For this mutation we would expect a milder progression (Becker) – However, there are exceptions, e.g. it is possible that while on DNA level the genetic code seems not to be disrupted, it IS disrupted in the temporary RNA copy because parts of the gene that are important for gene processing are missing. Since the protein is translated from this RNA copy (and not directly from DNA), the way the RNA copy looks like, is what determines whether protein can be produced. However, RNA and protein analysis can only be done on muscle tissue. How was the mutation found? Only by DNA analysis? Or was protein analyzed as well? I have son with DMD and we recive genetic test which shows c.3151C>T in exon 23coresponding to the mutation p.Arg.1051. What these mean? Can he take some terapy? I am sorry to hear about your son. The mutation you describe is a so called nonsense mutation (also called stop mutation). Genes contain the genetic code for proteins. Each gene has a start and a stop signal so the translation machine knows where to start translating the gene into protein and when the protein is finished. For most Duchenne patients part of the genetic code is lost (deleted) and therefore the code becomes unreadable, so it is not translated. However, for some patients, like your son, there is a very small change that changes the code for a part of the protein into a stop signal. This means that translations is stopped prematurely and no functional protein is produced. There is a therapy that addresses this type of mutations. It is called stop codon readthrough and the drug that achieves this is called Ataluren (tradename Translarna). Ataluren is approved for treatment of ambulant Duchenne patients 5 years and older in Europe by the European Medicines Agency. It is on the market in several countries in Europe. In addition there are access programmes for patients outside Europe. It is a treatment, not a cure. It does not stop the disease, but slows down its progression. Thank You very much for Your qucik replay. Can You tell me which clinic in Europa I can contact and go with my son. Ina our country, Bosnia, we do not have good doctors. Nobody tell as about this tretman. They do not know abou it. If You have some contacts please send me. Thank You very much. My nephew is suffering from Dmd duplication of Gene 57 to 60 what does duplication means is the prognosis same as deletion. I am sorry to hear about your nephew. The dystrophin gene has 79 exons. A deletion means that part of the gene is missing (e.g. exon 57-60). A duplication means that part of the gene is ‘doubled’, in case of your nephew he has exon 1-60, but then instead of exon 61, he has an extra copy of exon 57, 58, 59, and 60, and only then exon 61-79. The consequence of deletions and duplications can be two-fold: 1. They can disrupt the genetic code. This means that dystrophin protein cannot be produced and patients have Duchenne. 2. They can maintain the genetic code, allowing the production of a dystrophin that is slightly shorter but has its functional domains. These proteins are partially functional and are found in Becker patients (less severe disease). A duplication of exon 57-60 is unfortunately of the type that disrupts the genetic code. So you would expect him to have the severe type of the disease. There are exceptions to this rule however, so it is not possible to say this with 100% certainty. My son is 4 years old and has exon deletion from 48 – 52 . How feasible is an exon 53 skipping and i have read that trial results are due only in 2019 . What other treatments can be done in the mean time ? Exon 53 skipping is indeed tested in clinical trials at the moment. As yet we do not know whether it is effective or safe (of course we all hope it is both effective and safe, but the trial is done to evaluate this). What can be done already is provide good care to your son to keep him in as good a condition as possible for when hopefully a therapy is available. More information on care guidelines for Duchenne can be found here: http://www.dmd-guide.org/. This is based on two scientific papers published on this topic, but ‘translated’ into more accessible language non medically trained individuals. Referring to deletion exon 48 -52 my son was diagnosed based on DNA Results . Can you explain please the difference as part of symptoms and progression of the disorder would it slow or fast. is milder or sever ! A deletion of exon 48-52 unfortunately disrupts the genetic code of the dystrophin gene. That means your son cannot produce functional dystrophin and he would be expected to have Duchenne muscular dystrophy – the more progressive form of the disease. Here you will see that there are approaches in development that apply to all Duchenne patients regardless of their mutation. In addition there are mutation specific therapies in development. The latter have been developed furthest and two compounds have been approved: Translarna (in Europe) and Eteplirsen (in the USA). Translarna only applies to nonsense mutations – so the child you mention would not be eligible since he has a frame-shift. Eteplirsen is an exon 51 skipping compound, aiming to restore the reading frame. However, this would also not work for the child you mention since exon 51 is deleted already. Exon 53 skipping would restore the reading frame for this patient. Exon 53 skipping compounds developed by Sarepta therapeutics are in clinical development in the USA and Europe. To my knowledge no trial is currently going on in India, but I know DART (Duchenne Annihilation Research Trust, located in Bangalore) is preparing clinical trials in India. My Son is 7-years, Muscle Biopsy says consistent with DMD but MLPA ( Genetic Test ) reveals point mutation at 46 chromosome. I am sorry to hear your son has DMD. The mutation you describe however, does not make sense to me. Do you mean a deletion or duplication of exon 46? A small mutation in exon 46? Feel free to email me privately if you prefer (you can find my email address on publications). I will need this information to provide information about mutation specific appraoches. Very good to hear your son is doing physiotherapy – good care is the most important thing you can do for him! Mijn zoontje is 19 maanden en heeft Duchenne, hij heeft deletie 51. Kan hij met deze deletie in aanmerking komen voor exon skipping of is dit niet voor deletie 51 van toepassing? Exon skipping is een mutatie specifieke aanpak waarbij gepoogd wordt om Duchenne patienten een deels functioneel dystrofine eiwit te laten maken in plaats van een niet functioneel eiwit. Hiervoor moet tijdens het verwerkingsproces van gen naar eiwit dus een exon geskipt worden. WELK exon hangt af van de locatie van de mutatie. Een exon 51 deletie komt in theorie in aanmerking voor deze aanpak. Om de leesbaarheid van het gen te herstellen moet exon 52 OF exon 50 worden geskipt. Momenteel wordt er geen klinisch onderzoek gedaan met middelen om deze exonen te skippen. De focus ligt vooral op het skippen van exon 51, 45 en 53 momenteel omdat dit toepasbaar is op de grootste groep patienten. My grandson is 7 years old and was diagnosed as having DMD ( most probably )due to duplication of exons 53 to 57 .He is ambulatory and does physiotherapy is specialized center . we give him Tamoxifen 10 mg daily for 1.5 months now . He is doing better since then . What is your comment on the duplication regarding prognosis and treatment . Also ,if you have any comments on Tamoxifen ( I know that it is in clinical trial but I took the risk because I cannot wait till I see him helpless and not moving so early ) . I am sorry to hear about your grandson. Good care is really the best thing that can be doen for him – this means physiotherapy but also has other aspects (see http://www.treat-nmd.eu/care/dmd/family-guide/). I cannot comment on tamoxifen other than that it is a therapy that has yet to be tested in Duchenne patients. It has yet to be shown that this drug is effective and that it is safe in Duchenne patients. The fact that it works in mice is no guarantee that it will work in patients. The fact that it appears to be safe in mice is no guarantee that it will be safe in Duchenne patients. Regarding the duplication: it is expected to disrupt the genetic code of the dystrophin gene and as such is a “Duchenne type” of mutation. The milder disease course of Becker is expected for mutations that do NOT disrupt the genetic code. However, how your grandson will progress exactly is difficult to predict since every patient is unique. This will depend on how well his muscle regenerates, how well his immune system works, how muscular he is to begin with etc. Coming back to the start: the best thing to do is to make sure he has good care – this is the best way to slow down the breakdown of muscle as much as possible. The question is the said mutation disrupted the whole function of the gene or only the site beyond or below the mutation site(exons)in other words the gene is functioning till Exon 52 only that can translate the proteins before the duplicated exons or not functioning at all? Another question if the site (region) of mutation in specific area of the gene differs in severity than other parts of the gene even if disrupt the reading frame for example if I have 2 patients,1 with duplication of Exon 18-22 (out of frame) and the other patient has duplication of Exon 53-57 ( out of frame also) do both of them have the same severity or not? I am sorry to hear your son has Duchenne. I will try to explain some of the genetics to you – hopefully this will answer your questions. Duchenne is caused by a failure of patients to produce a functional dystrophin protein. The dystrophin protein fulfills a linker function in the muscle. One side of it connects to the skeleton/internal structure of the muscle fiber, the other size connects to the connective tissue surrounding the muscle fiber. In between there is a spring like system consisting of 24 similar domains. The connection stabilizes muscle fibers upon contraction. Duchenne patients have a mutation that disrupts the genetic code of the dystrophin gene (out-of-frame mutations). Consequently, the code becomes unreadable after the mutation. Because the important domains of dystrophin are located at the start and the end of the protein, the resulting dystrophin will not be functional. It will lack the domain that connects to the connective tissue. As such it does not matter whether the mutation is at the start or in the middle are even close to the end – the crucial domain at the end will be missing and therefore the dystrophin is not functional. In fact, the part in the middle of dystrophin is redundant. We know this because in-frame mutations affecting the middle of the protein keep the genetic code readable. As such dystrophins can be produced that have the important domains at the start and the end, but are shorter in the middle. These proteins are found in the less severe Becker muscular dystrophy. In summary, for out of frame mutations it does not matter where the mutation is located – if the domain at the end of the protein (encoded by exons 64-70) cannot be produced, the protein will not be functional. As such they will both cause Duchenne. Please do not hesitate to ask for clarification if this is not clear to you or ask follow up questions. First:is there any trials currently recruting regarding the mentioned mutation for my son(duplication 53-57)? Third: which is better “Prednisone or deflazacort” noting that our neourlogist has recommended Prednisone 15 mg/d in addition to multivitamins,but we didn’t start steroids yet? Fourth:she recommended swimming 1hr a week but didn’t recommended physiotherapy right now? Last question:shall we start using night splint and hand braces for him now or later?,also shall we delay steroids or start now? There are no clinical trials ongoing specifically targeting your son’s mutation. However, there are multiple trials ongoing for which mutation type is not an issue. See for an overview: http://www.treat-nmd.eu/dmd/research-overview/introduction/. The mutation specific approaches currently under evaluation (exon skipping and nonsense codon readthrough) will not apply to your son’s mutation. However, approaches aiming to reduce fibrosis, improve regeneration, decrease inflammation will apply to all DMD patients. Could you please tell me what is the difference between non sense (stop codon) mutation and large duplication that alter the reading frame like my son’s case,as i know that both disrupt the reading frame but do both have the same severity phenotype? And different propability of the total absence of the dystrophin protein? A nonsense mutation does not disrupt the reading frame. It changes the genetic code at one position so that the code reads “stop” rather than genetic information. These stop codes are normally only present at the end of the genetic code, so the translation machinery knows the protein is complete. When a mutation changes the genetic code into a stop earlier in the gene, the translation stops too early and the protein is not functional. So the consequence is the same as with frame-shifting mutations (translation stops too early and protein is not functional). As such, these nonsense mutations cause DMD, like the frame shifting mutations. The MLPA results suggest there is deletion of exon 48 to 52 of the DMD gene at hemozygous state. However this test will not detect any alteration that lie outside the target probe sequence.The deletion within the DMD gene results in frame-shift and therefore premature dystrophin , which agrees with the DMD diseases. diagnosis. The MLPA will test for each part of the genetic code of the dystrophin genes (the so called exons) whether they are present or not. In case of your son, exons 48, 49, 50, 51 and 52 are missing. This disrupts the genetic code, so starting at exon 53 this becomes unreadable for the machinery that translates gene to protein. He therefore cannot produce functional dystrophin. Exon skipping aims to restore the genetic code by making the deletion one exon larger. In case of your son’s mutation, exon 53 skipping would restore the genetic code. Exon 51 skipping will not work because your son does not have exon 51, so it cannot be skipped. I’ve sent you an email about the twin boys of a friend of mine. Is there a clinic you work in The Netherlands? By any chance can we contact you for an appointment? Please, my friend is desperate specially becouse in the city he lives in Brazil doctors know very little about it. I am not a medical doctor so I cannot see your friend’s sons. I will email you about options in Brazil. That would extremely helpfull!!! Thanks a lot!!! Looking forward to your e-mail. My son has a single base deletion in exon 56 (c.8375delA). Is exon skipping working with such small deletions. Which exon needs to be skipped to restore a truncated dystrophin for him? 2. While the larger deletions that remove one or more exons are clustering in the area of exon 45-55, small mutations (like the one of your son) occur in all exons. This means that exon skipping for small mutations applies to very small groups of patients (less than 0.1% of all patients generally). So exon skipping as it is currently in development for DMD will not be applicable to your son, unfortunately. However, all the mutation independent approaches in development (anti-fibrosis, anti-inflammation, pro-regeneration, mini-dystrophin, utrophin upregulation etc) do apply. Thank you very much for this explanation. Hello, the 5 year old son of our very good friends has just been diagnosed with DMD with duplications of Exon 6 and 7. We live in Turkey and I wondered if you could give us any information on clinical trials or treatment options available in this country? Also, if they were able to travel would there be any other trials you could recommend? I am sorry to hear about your friends’ son. Note that Turkey has a very good Duchenne specialist, Dr. Haluk Topaloglu and that he is involved in multiple clinical trials. I do not know by heart which ones are currently happening and whether your friends’ son would be eligible to participate, but I am sure his team will be able to inform you about that. Note that participation in clinical trials is a burden. Clinical trials are experiments in humans. There is no guarantee that the test drug will work and they may be unsafe. Also trials generally mean many hospital visits – so this in and of itself is a burden as well. It is best to participate in a trial that is local – this reduces the travel burden for the patient and the family (e.g. weekly hospital visits are more rule than exception) and trials may be daunting to the patient, especially when he is young and when the trial is in another country where they speak a different language. So when possible I would recommend a local trial. Genome editing (using CRISPR/Cas9) can in theory correct both deletions and duplications. For deletions, the aim is to restore the genetic code, while for duplications, the aim is to restore the normal code. This can be achieved by cutting out the duplicated parts. However, this work is as yet in a very early stage and only tested in patient-derived cell cultures. So there are no clinical trials ongoing specifically for duplications at the moment. Note that all therapies that are not mutation specific would apply to all patients (so also patients with duplications). My 6 months grandson was found to be missing exon 46-47. We were told it is Duchenne. Is there any chance this could change as he gets older? What about skipping therapy? I am sorry to hear about your grandson. For a deletion of exon 46-47 indeed Duchenne muscular dystrophy is expected, because this mutation disrupts the genetic code. There are sometimes exceptions (i.e. patients who have a milder progression than anticipated), but unfortunately these are few. Hi, I would like to ask which mutation (deletion, duplication and point) is/are not suitable for exon skipping and why? The dystrophin that is produced after exon skipping needs to have all its functional domains. The dystrophin has one dystroglycan binding domain encoded by exon 64-70. This is absolutely crucial. So if a mutation is located/includes exon 64-70, exon skipping will not result in functional dystrophins. This goes for all types of mutations (deletions, small mutations and duplications). With deletions parts are missing, while with duplications parts are double. However, the extra parts of dystrophin can affect the folding of the protein, so that while they are present, they are not functionally active. The dystrophin has 3 actin binding domains, two encoded by exons 2-10 and one encoded by exon 32-45. To be functional dystrophin needs at least one actin-binding domain. So mutations that remove all three are not eligible for exon skipping, since the resulting dystrophin will not be functional. Note that the first two actin binding domains are “better binders” than the third one. So a dystrophin that lacks the first two domains is less functional (associated generally with more severe Becker) than a dystrophin lacking the third actin binding domain (associated with typical Becker). For small mutations (point mutations) it is not possible to affect all three domains – only for large deletions and duplications this can be an issue. With deletions parts are missing, while with duplications parts are double. However, the extra parts of dystrophin can affect the folding of the protein, so that while they are present, they are not functionally active. The dystrophin has a connecting domain that is encoded by exons 11-63. This domain is largely dispensable. However, when deletions are longer than 36 exons, the domain probably becomes too short. For duplications it is not known how large they can be and still result in a functional protein. For small mutations of course the exons deleted after exon skipping will never involve more than 36 exons. My son is 5 years old and gene 49, 50, 51 and 52 are delete, I would like to know more about possible treatment and institutes where I can contact for cure of his DMD illness, I really need guidance please help. Unfortunately there is no cure yet for DMD – not anywhere in the world. There is good care which can help slow down the progression of the disease – you can find out more about this here: http://www.treat-nmd.eu/care/dmd/diagnosis-management-DMD/ It is important to find a hospital with experience in caring for Duchenne patients so that your son can receive the care he needs. Also there are therapies in development and two therapies have been approved now. However, these are mutation specific and your son is not eligible for those. He would be eligible for “exon 53 skipping”, which is tested in clinical trials. This means that as yet we do not know whether this appraoch is safe and/or effective. Also know that the therapies currently in development are unfortunately not cures – they aim to slow down the progression of the disease. I am sorry I cannot give you more positive news. Know that there are many people world wide who work hard to find a better therapy for Duchenne, but that this is challenging. My son have Exons 45,46 and 47 are deleted. He is 32 months old now,we don’t see any notable symptoms so far. He is ahead to reach his motor skills like crowling and walking. When he tested for jaundice last year due to some other illness his liver enzymes were elevated and they see liver was normal so they started testing ck and genetic testing. His doctor is saying RNA analysis is needed to confirm whether this is mild and severe type though it’s a inframe mutation. We are so scared what will be the outcome of RNA tests. Can you please help to confirm is this kind of mutation happened to anyone already ( Exons 45,46 and 47 deleted) and what will be the type of their disease whether it’s mild or severe.please help. Sorry to hear your son has a mutation in his dystrophin gene, but glad to hear he has no notable symptoms so far. For mutations that are in-frame, one would expect the milder disease (Becker) rather than the severe disease (Duchenne). Note that RNA analysis requires a muscle biopsy – which is a painful and invasive procedure. As such, this is only recommended when the symptoms do not match the genetics (e.g. in-frame with severe symptoms or out-of-frame with mild symptoms). This does happen sometimes (in about 10% of cases) and the mutation you describe has been found in Becker patients but also in some Duchenne patients. When the symptoms match the genetics (90% of cases), the international guidelines for Duchenne diagnosis, care and management (see https://www.ncbi.nlm.nih.gov/pmc/articles/PMC5869704/figure/F2/ – from this paper: https://www.ncbi.nlm.nih.gov/pmc/articles/PMC5869704/) do not recommend RNA analysis. So I recommend that you ask the doctor why (s)he thinks RNA is needed. Is the disease more severe than expected for a Becker patient? If so, then the analysis makes sense. However, if your son does not have the typical Duchenne symptoms, I do not think the RNA analysis is needed. Doctor mentioned it’s a blood test for RNA analysis not the muscle biopsy. They say in particular in frame deletions (like my son’s) needs RNA analysis to confirm whether it’s a Becker or Duchene. Does CK elevation (as it was around 30k ) matters to confirm Becker Vs Duchenne. CK elevation means there is something wrong with the muscle – in case of muscular dystrophy the muscular dystrophy is ‘what is wrong’ and why the enzyme leaks from the muscle into the blood. The elevation points to a problem with muscles, but it does not tell you which problem there is (i.e. which protein is missing or not only partially functional) – this is why the genetic tests are needed. One cannot say which muscular dystrophy a person has based on how high the CK levels are because CK levels also vary due to e.g. time of day, how active you have been and how muscular you are etc. RNA analysis in the blood will not be informative at all. Dystrophin is not expressed in the blood, which will make the analysis very challenging and has the risk of misinterpretation. The guidelines (internationally recognized, published in The Lancet) say that DNA analysis by MLPA is sufficient for deletions involving multiple exons. There is never a need for RNA analysis in the blood (because this is not informative) – if the symptoms do not match the genetics, RNA anlaysis can be done on muscle. I had a discussion with doctor and currently hold on RNA analysis. We have in person appointment scheduled for next week to talk more on this. Earlier you mentioned exon 45-47 deletion shows in both Becker and Duchenne. Without RNA analysis what decides the disease is mild (Becker) or severe (Duchenne), is it symptoms? or based on the age symptoms occurs? can you please give more details like in Duchenne at which age age typically symptoms start and is developmental growth (motor skills) is always delayed with this case. And with Becker what will be the symptoms and usually at which age symptoms start. The severity of the disease is determined by the symptoms and when they occur. Duchenne is the more severe form, and symptoms occur already early in life, at around the age of 1-3 years old. Patients e.g. will have difficulty with walking, hopping/jumping, climbing stairs and will fall frequently already before the age of 4 years. For Becker there is a lot more variation in when the disease starts – in some patients this is in childhood, in some patients this is in adolescence or even adulthood. So here it is not possible to give a specific age – it varies – even when several patients are affected in the same family, when the symptoms start and how severe they are can differ between the patients. Note that I am NOT a medical doctor – what I write about the symptoms is what I know from the literature and what I have heard from clinicians treating Duchenne and Becker patients. Hello my son who is 3 yr old has been diagnosed with duplication of exon from 8 to 11 of the DMD gene, is there any cure or medicine in the pipiline to correct this dysfunction of exons? im a father of a 7 years old boy, he have DMD because of exon2 duplication’, is any solution available today to solve this kind of mutation. At the moment there is no cure for Duchenne. There are therapies in development that aim to slow down disease progression. This is done by one in 2 ways: 1) trying to restore the missing protein 2) trying to improve the muscle quality. Restoring dystrophin is often done in a mutation specific way. For an exon 2 duplication, exon 2 skipping would restore the genetic code of the dystrophin gene. At the moment this is not tested in clinical trials, but Kevin Flannigan is doing preclinical tests to assess exon 2 skipping in cell and mouse models. What is the anticipated prognosis for a duplication of exons 52 and 53? A duplication of exon 52 and exon 53 would be expected to maintain the reading frame. So in theory one would expect this mutation to be associated with Becker muscular dystrophy. However, duplication mutations often have unpredictable impacts on how the gene transcripts are processed and a significant number of duplication mutations that do not disrupt the readin frame result in Duchenne, and vice versa duplication mutations that disrupt the reading frame can also result in Becker muscular dystrophy. So the ‘prediciton’ is a lot less reliable than with deletion mutations. Thank you very much for your prompt response, I think I have the child well on track because he is enrolled precisely with Kevin Flanigan at the Ohio hospital, where he is working on the subject, what worries me is that he is alone with his team watching this issue of exon 2 duplication. Anyway, I thank you for your attention and I am happy to know that there are still good people in this world who try by all means to make happy the families that suffer for their children. Can you kindly guide how can we determine whether a point mutation in DMD gene is in frame or out of frame mutation? and if a particular nonsense mutation can be corrected by ataluren. I would be grateful if you can provide me literature on the recent mutation spectrum of Duchenne worldwide and the diagnostic methods and therapies available so far. All nonsense mutations should be correctable by ataluren. Whether a point mutation is in-frame or out of frame depends on how many basepairs are involved (a basepair is a DNA building block). If there is a deletion or insertion of basepairs: if the number is divisible by 3 (e.g. deletion of 6 basepairs or insertion of 3 basepairs) the mutation is in-frame. If it is not divisible by 3 (e.g. deletion of 5 basepairs or insertion of 1 basepair), it is out-of-frame. A nonsense mutation does NOT disrupt the reading frame – however, because the code for an amino acid is changed into a STOP code, it leads to truncation of translation of the code from gene to protein and therefore a non functional protein. So the effect is the same (out-of-frame mutations also lead to a premature truncation of translation, but for a different reason – the code becomes unreadable). Exon skipping for duplications is challenging. What would be required in case of your sons is skipping of either the first exon 44 OR the second exon 44. Either way would restore the normal dystrophin code. HOWEVER, the compounds used for exon skipping (antisense oligonucleotides, AONs) recognize both exons 44 – so there is a possibility that both exons will be skipped. This would disrupt the genetic code (just like the exon 44 duplication does). If we test AONs for exon 44 skipping in cultured cells of a patient with an exon 44 duplication, what we see is that both exons are skipped. So this is not helpful. It is possible however that when patient would be treated this would not be the case. For both exons to be skipped you need 2 AONs in the same cell (one to bind the first exon 44 and one to the second exon 44). In cultured cells this is easy to achieve (the cells receive an overdose of AONs so to say). However, in a human being the amount of AONs is much lower and as such it is anticipated that most cells will have no AON at all, and some will have 1 AON and hardly any with have 2 AONs. Therefore it is expected that in a patient, this would work better than in cells and that there might be some dystrophin restoration expected. However, exon skipping has so far never been tested in patients, so there is no hard evidence yet. At the moment there are no exon 44 skipping compounds in clinical development, so for now this is unfortunately only theoretical. I am a father of child with exon 55 deletion reported in DNA Blood test. 2. My kid is 5.6 yrs and is able to walk and play. only difficulty with him is stair climbing now. 3. He is on put on Steroid 20mg, after a month having this medicines his face changed to moon one. Pl. pl. support my child to live a normal life with and strength to overcome this. I am sorry to hear about your son’s condition. With regards to your questions: Steroids unfortunately have side effects (such as the moon face) – however, they are slowing down the disease a lot. They allow patients to walk longer and have a better respiratory function and better survival among others. MLPA: when a deletion of one exon is found with MLPA, a second test is needed. MLPA uses probes to test whether the exon is there or not. Most likely your son has a deletion of exon 55 (i.e. exon 55 is not present). However, it is also possible that there is a small mutation within exon 55, which would mean that the probe cannot bind to exon 55. So a PCR test is needed to check whether exon 55 is deleted or not – generally this is done automatically, but please check with the team that did the diagnosis that this was done. Several mutation specific therapies are available, such as eteplirsen (exon 51 skipping, would not work for an exon 55 deletion) and translarna (only for nonsense codons, not for deletions). In India I know Dr Vishwanathan in Chennai – he has a lot of expertise with trreating DMD patients.